Green tea is from the same plant (Camellia sinensis.) as all other teas. After the tea leaves are plucked and sorted, they are either steamed or pan fired. Green tea does not go through the oxidation (fermentation) process that is a step in making black tea. The leaves are often rolled into different shapes before drying. Green tea has less caffeine than black or white tea and also has HGCG; the most powerful antioxidant known. This can only be found in green tea. 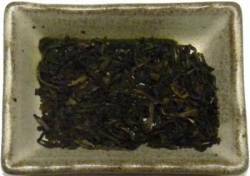 Japanese Sencha tea blended with fire toasted rice for a sweet, nutty tasting tea. Sweet cherry flavor and rose petals blend for an exotic taste that is also delicious iced. Roasted Japanese green tea with a rich nutty flavor and lower caffeine than other green teas. 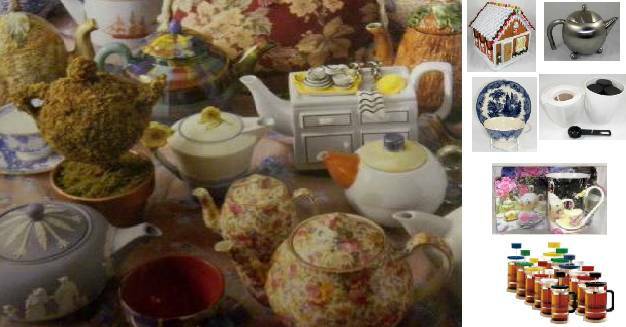 A wonderful China Dragonwell tea that is full bodied with a sweet flavor. A wonderful blend of top quality young hyson grade green tea blended with fragrant bergamot. Hand formed premium green tea that has the appearance and taste of delicate white tea. Made from the twigs of the tea plant for a sweet creamy infusion with nutty undertones. Japanese green tea with a slightly vegetive, but fruity taste. 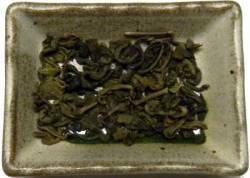 A superior grade of China green tea with a wonderful sweet, mellow taste. Pan firing right after plucking the leaves seals in the flavor of this 2nd flush tea. A pleasant blend of tart lemon with the sweetness of green tea. Try it iced! A pleasant Spring Young Hyson grade tea with a lightly sweet taste. A very fragrant and sweet premium tea from Japan that brews up without any bitterness. A steamed green tea from China with strong body and a nutty taste. 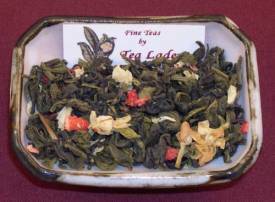 Early spring tea with a great depth of flavor. The leaves are hand formed from jade colored buds. An early spring tea blended with chamomile and lemon grass for just a hint of lemon. Hand sorted organic green tea with a bright green infusion and an intense green tea taste. 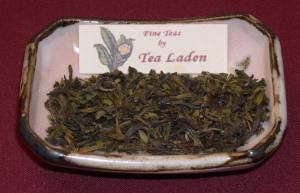 Traditional long leaf style tea that has been decaffeintated with CO2 process from China. A Japanese green tea made from Matcha the fine green tea powder used in tea cermonies. A second flush tea that is steamed to bring out its light, delicate flavor. Refreshing cool mint makes a very refreshing tea that is also great iced. The addition of jasmine petals gives this tea a lovely appearance and floral taste. A Chinese style sencha tea blended with sunflower petals and dried peaches. Great iced! Hand rolled tea with a smooth and delicate flavor and a heavenly jasmine scent. A popular steamed green tea that has a sweet, light taste. Green tea blended with strawberries and jasmine that makes an excellent iced tea. Each leaf is a very neat single bud and its shape resembles a bamboo leaf. An aromatic green tea with an aroma that fills the cup and has a fresh blueberry taste. Green tea blended with fresh spices that is delicious, especially with milk and sugar.